Located 45 miles southeast of Bend on the shores of East Lake in the caldera of Newberry Volcano, East Lake Resort was opened in 1915 and rebuilt in 1942, when it became a full-service facility. 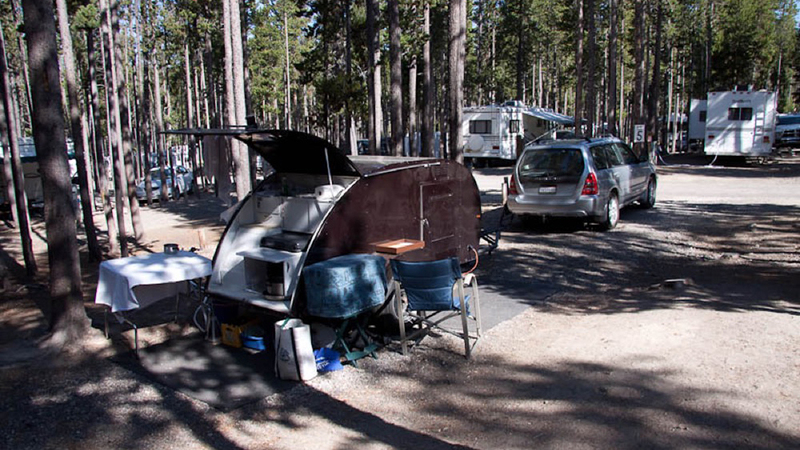 Camping options include 6 lake-front tent sites, and 40 RV sites for rent. Reservations are required in July and August but walk-ups are welcome during the months of May, June and September. Water sport enthusiasts can rent watercraft from paddle boards to pontoons to fishing boats; all fantastic options for taking full advantage of the 1,050-acre lake that sits at 6400 feet above sea level. East Lake is known as one of the finest lake fisheries in Oregon, and anglers will find Brown Trout, Kokanee, and Rainbow Trout available throughout the season. The on-site general store and tackle shop is fully outfitted for any last-minute fishing “emergencies”. Camping supplies are also available, from firewood to canned goods to the all-important bag of marshmallows. In addition, the resort has a gift shop (grab your East Lake Resort logo gear) and, for those who want a break from cooking over the fire or on the camp stove, The Blue Duck Grill serves up hearty, honest pub style food.